June is Brain Injury Awareness Month across Ontario and the Brain Injury Society of Toronto (BIST) is inviting you to this exciting EVENT and Survivor Celebration! The 11th Annual event is set for June 16th at Nathan Phillips Square from 11:30-2:30pm. 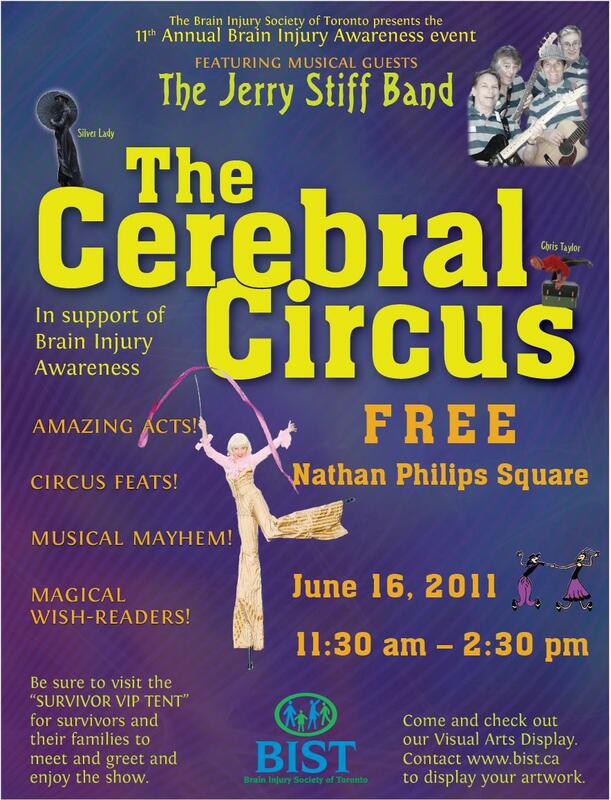 This year’s event titled “The Cerebral Circus” promises great entertainment with Jugglers, Animators, and Stilters. Live musical guests include performances by The Jerry Stiff Band. Come and support the Brain Injury Survivors, who will display their artwork and talents, and help raise awareness about the effects of brain injury. Bring your friends, bring your support and join the lunch hour fun! We are again proud to feature the “SURVIVOR VIP TENT’ where survivors and their families are invited to meet and greet other survivors, enjoy the entertainment and hear about Personal Stories of Courage and Achievement.